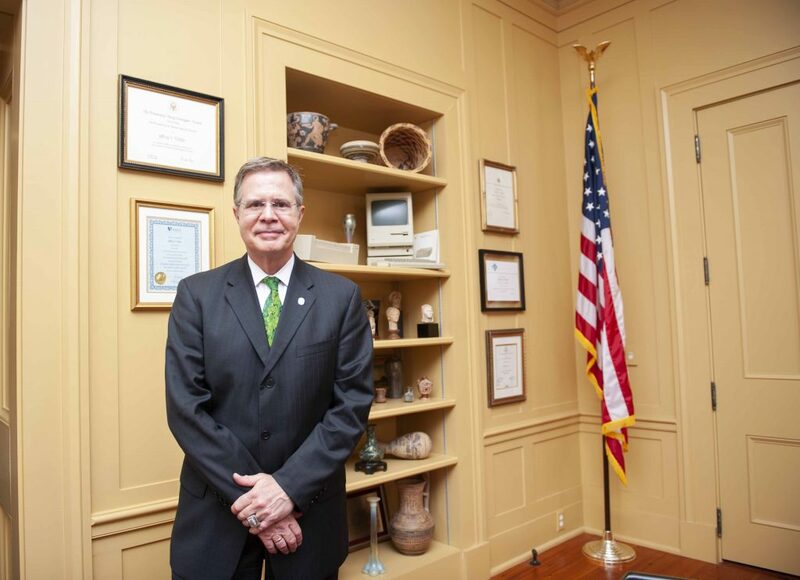 Where is former Chancellor Jeffrey S. Vitter? Former Chancellor Jeff Vitter is not teaching any classes this semester following the announcement that he will serve as a tenured distinguished professor in the School of Engineering’s Department of Computer and Information Science. Dawn Wilkins, chair and professor of computer and information science, said she was unaware of Vitter’s desire to return to faculty until she read the Nov. 9 press release announcing his resignation from the Office of Chancellor. Read more coverage of Jeff Vitter’s resignation here. “It was as much a surprise to me as it was to everyone else,” Wilkins said. The Institutions of Higher Learning announced Vitter’s resignation on Nov. 9 and emphasized his intent to take a faculty position teaching computer science. “There is no more important role on a university campus than as a faculty member,” Vitter said in that press release. Wilkins said Vitter is not teaching a class this semester because course schedules were set in October, before she was informed of his intent to teach classes. She said the former chancellor is doing research this semester and has an office in the Center for Manufacturing Excellence. “We don’t have space, so we found him an office elsewhere on campus,” she said. A university spokesman said Vitter is “not entertaining media inquiries.” Wilkins said that for now, the department will have to “play it by ear.” She said Vitter has a background as a theoretician and has done lots of work with big data and biomedical research. “I don’t know what’s going to happen in the future, and I don’t know if he will stay,” Wilkins said.